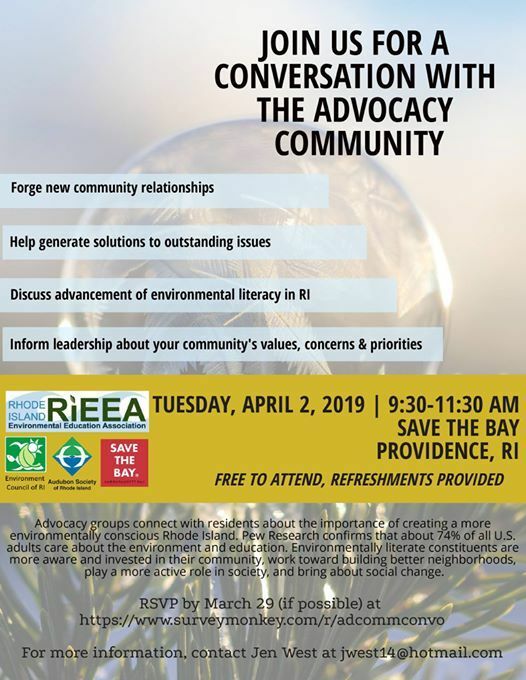 RIEEA and the Audubon Society of RI, Environment Council of RI, and Save The Bay invite you to discuss the advancement of environmental literacy and education efforts in Rhode Island and how they support your work in the advocacy sector. There is no cost to attend and refreshments will be provided. Although not required, an RSVP by March 29 ( https://www.surveymonkey.com/r/adcommconvo) would be appreciated so we may contact you with any updates. We would greatly appreciate any efforts to spread the word to others in the advocacy field. 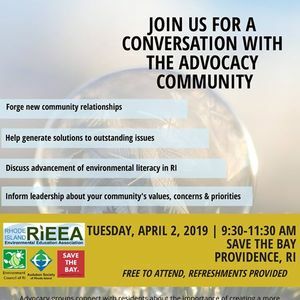 Visit http://rieea.org/advocacy-community-forum-tues-april-2/ for a sharable flyer. 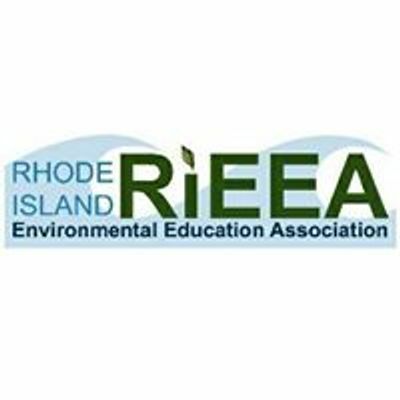 Advocacy groups connect with residents about the importance of creating a more environmentally conscious Rhode Island. Pew Research confirms that about 74% of all U.S. adults care about the environment and education. Environmentally literate constituents are more aware and invested in their community, work toward building better neighborhoods, play a more active role in society, and bring about social change. Your feedback will help to further refine our understanding of the issues and help generate solutions; build support for efforts already in place and for developing new programs; forge new community relationships and strengthen existing partnerships; inform leadership about your community’s values, concerns and priorities; and help us root our work and decisions in what matters to people. We hope to see you there! If you have any questions please don’t hesitate to contact Jen West, the event facilitator, at andlc3QxNCB8IGhvdG1haWwgISBjb20=.